Totems will make you rich as they enhance your gems. But they are fragile and will be destroyed after using them a few times. You may need to relocate to a new dungeon and may even have to set up a traps again to make sure nobody infiltrates your totem and steals away those precious gems. 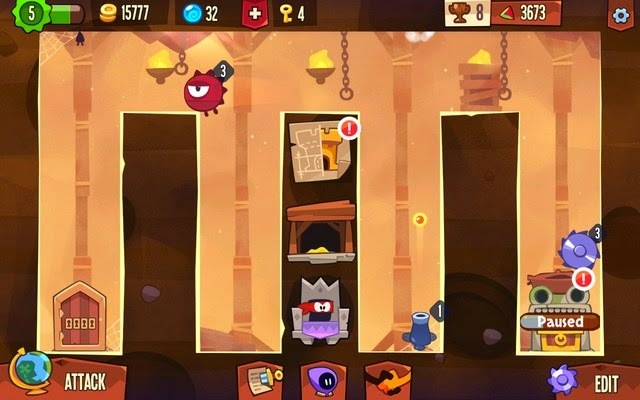 Here are some basic tips that may provide some ideas on how to set-up traps in King of Thieves. 1. Don’t make your trap set-up too hard. Remember you will need to “test” your set-up twice in order to save it. Of course that does not mean you should make it easier for infiltrators, just make sure that there are very few loopholes. The set-up should make the player think twice before running and leaping over obstacles. 2. Placing cannons facing each other can be a good idea, but place one of them closer to the entry point. Just make sure one of the traps is placed around the door to make it harder for rival thieves to get past them. Also, don’t forget to place a trap in and around your totem. I usually put blades near my totem. 3. There will be different dungeon layouts as you may have to move places frequently. Make your dungeon your new home and adapt to the surroundings. 4. Upgrade your traps. This is one the best ways to make your set-up stronger. Tap on an object, guard or blades and the tap on “Upgrade”. Leveling-up guards makes them faster, whereas upgrading cannons boosts their attack rate, making them shoot cannonballs faster. Upgrading blades will also increase their attack stats, making them swirl faster. 5. Level-up your lock. This will add more fake keyholes to your dungeon door. Tap on your dungeon blueprint and select lock. Each upgrade increases keyhole by one. Another key upgrade is the “Gem Defense Chance”. You will need to upgrade “Gold Mine Speed” to level 4 to unlock this. Gem Defense Chance boosts your chances to defend totem gems from other players’ attacks. You may have seen a roulette-like board appear soon after you have won a level. 6. Upgrading Gem Defense Chance decreases area of the pie slices, thereby decreasing chances of the needle pointing towards a gem placed on it. 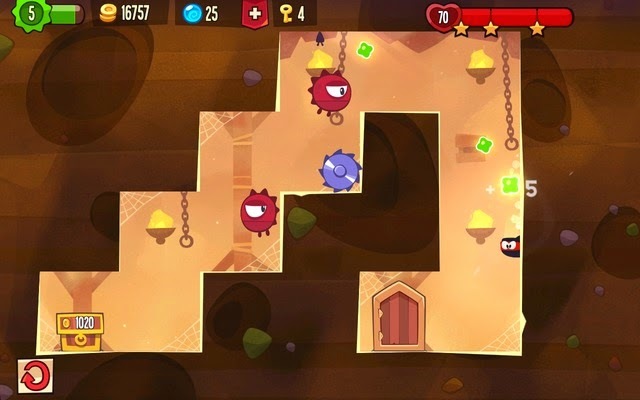 The gem slice area decreases if the character’s health decreases and one of the traps disappears, so an upgrade will definitely lessen the chances of earning a gem. 7. All upgrades require coins, so make sure you raid more dungeons, both in solo and PvP missions. Your dungeon has a gold mine that replenishes over time. Don’t forget to increase the gold mine capacity. It will produce more gold if the production capacity is increased. Along with capacity, increase the gold mine speed to speed-up production (Needs “Lock” to be upgraded first to level 4 before you can unlock this upgrade). 1. Your character runs automatically. You should tap on the screen only when you want to leap over traps or jump off the wall to change direction. Don’t jump when your character reaches the edge of a chasm, especially when there’s a trap placed on the opposite wall. Let him slide down. Tap to jump when you want him to go higher above. Know when to jump and let him run when you can’t see any threat nearby. 2. Sometimes patience may spell doom. Waiting for that right moment can be a good idea, but in several occasions I have seen that being quick can help you reach your target easily. It’s all about timing and how quick you are in avoiding traps, which is why playing the waiting game may be not be a good idea every time, especially when there are too many traps around and you have less time to react. 3. Practice playing solo missions before stealing gems and gold from other players. Playing solo missions not only lets you earn XP and gold, but also unlocks dungeons and gem carts. Timing is crucial and so playing solo missions is a great way to get that timing right and know when to jump over cannonballs, dodge guards and avoid blades. 4. Remember that each player had to test their dungeon to save it before they could finalize their trap set-up. This means there is definitely an easy way to infiltrate their totem. Inspect the dungeon before hitting on “Tap to Start” and start running and jumping once you find out a loophole in the set-up. You may even wait after the level starts, in case there’s no trap nearby. 5. Upgrade your character’s outfit. Crafting a new outfit will make your character faster and stronger. You will need materials like leaves, rocks etc. to purchase it. You earn materials after completing the enhancing ritual. Put gems in the totem and collect materials soon after the enhancing ritual is complete. 1. Collect green slimy stuff in every level to fill up your EXP meter. The XP meter is located at the top-left corner of the screen. The more orbs you collect, the faster the bar fills up. Keep an eye on the XP bar. Once it gets filled up, your character levels-up. Level-up rewards are usually extra lock picks and blue orbs. A level does not reset, so if your character dies after collecting a green orb, you don’t have to gather it again. The green slime will be stored in your XP bar. You can also earn bonus green orbs by fulfilling quests. Tap on the “Missions List” icon in your dungeon to find out what quests need to be completed in order to earn green and blue orbs. 2. Lock picks refill over time, but the restoration speed is usually slower. 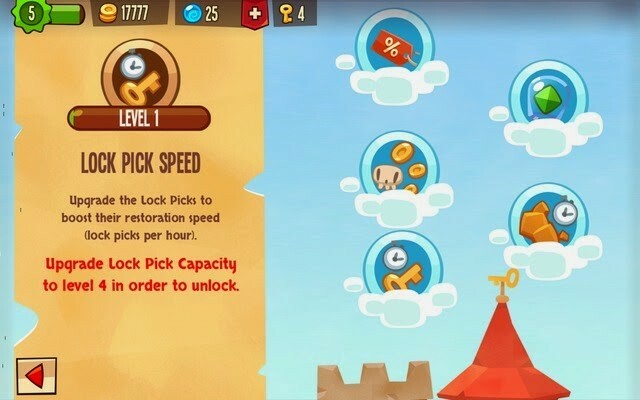 To boost their restoration speed, tap on the castle blueprint icon in your dungeon and select “Lock Pick Speed” (lock pick/timer icon). However, you will need to upgrade “Lock Pick Capacity” to a certain level first before upgrading it. 3. Upgrading “Lock Pick Capacity” is a sure-shot way to get more keys after leveling-up your character. This upgrade increases keys by one. Play more solo missions and PvP matches to earn green orbs and level-up.